Only 2 more days before the start of our 2014-15 winter season! We’re planning an amazing opening for you this year, one that will rival even our 75th anniversary season, which was truly memorable. We’re counting on kicking everything off with a full summit to base run, on the North AND South sides. This is a first for us! If the tendency continues, skiers and snowboarders will have access to a total of 16 runs throughout the weekend. A small concession will have to be made at mid-mountain on the South side, where a narrow trail must remain clear as to allow work on the TGV lift to continue unhindered. Skiers and riders will therefore have to briefly remove their skis or snowboard and walk a few feet to reach the great snow on the bottom half of the run. Visitors arriving to the North side will be happy to know that the parking lot, ticket office and other facilities will be open, albeit with limited service. Snow wise, our team has been working day and night to provide the best gliding conditions possible for opening day. Mother Nature did her part in the last few days and pitched in with over 15cm of fresh snow. And she’s still pilling it on! According to The Old Farmer’s 2015 Almanac, snowfall will be above normal this winter. Looking out the window lately, we think these wise farmers might indeed know what they’re talking about. Our team has made several improvements to the snowmaking system this year, including major work on the McCulloch run, and we’re already seeing the positive impacts it had in several key areas. 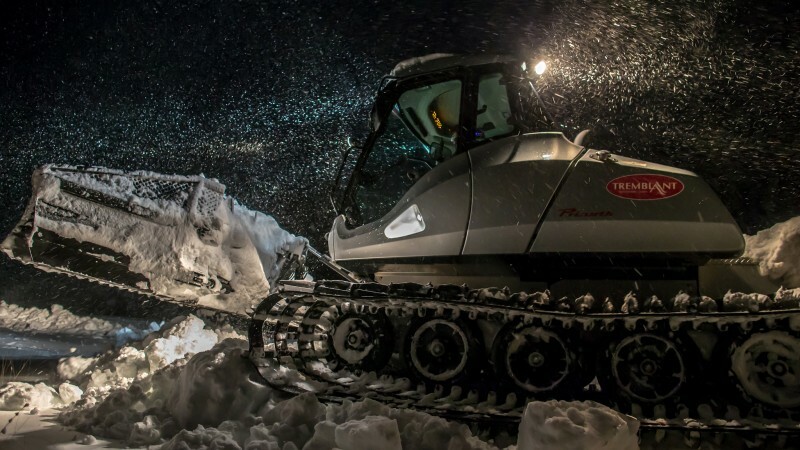 We also have a recent addition in our mountain equipment fleet: a new groomer! It is identical to the model which was added to the fleet last winter. This model has consistently proven itself and we are confident it will deliver an excellent gliding surface. Only thing left is to wish you a wonderful ski season!